Of course, when you pick apples you end up with lots and lots of them. Like, more than you'd ever need or want. But you're not going to waste any, are you? No, you're going to eat them for breakfast, lunch, and dinner. And you're still going to have way more than you want. In order to make a significant dent in your pile, you've got to find a recipe that requires a large number of apples. I've got just such a recipe: applesauce. And this applesauce, my friends, is about the easiest you're gonna find. Not only do you just throw everything in the slow cooker, but you don't even have to peel the dang apples! Keeping the skins on also makes this sauce super healthful, as most of the apples' nutrients are in their peels. Apples are not only popular with kids and adults alike, but they are also a good source of Vitamin C, fiber, and polyphenols. *My apples (a combination of Baldwin and Cortland) were on the small side; I just filled my 6-QT slow cooker to the top with them; if you're using bigger apples you won't need as many to fill your crockpot! **I'm a believer that a little cinnamon goes a long way; this amount gives a nice hint of the spice but you should feel free to add more, if it floats your boat. Fill the Crockpot with your apples, add the rest of your ingredients, and give it all a quick stir. Set it to cook on low for five to six hours. The smell of applesauce cooking away is fantastic; people pay good money for candles that don't smell half as good. My apples were fully cooked at about five hours but I left them in for almost six hours; they get more of that gorgeous caramelized flavor and richer color the longer they cook. (Another bonus of keeping the skins on is that the sauce becomes a lovely berry hue). When your apples are done cooking, let them cool a bit before using an immersion blender to fully incorporate the skins into the sauce. I just pulsed it enough to break up the skins, but not too much, as I didn't want a super smooth sauce. NOTE: if you decide to peel your apples before cooking, you can just run a fork through the cooked apples and they will fall apart into applesauce! My hubby likes lots of extra cinnamon on his. share a jar with friends who didn't get to go apple picking! Today, I'm going to make a Sour Cream Apple Loaf and maybe a sandwich of sharp cheddar, apple slices and honey mustard. Tomorrow...who knows? What's your favorite way to use loads of apples? For some other recipes in our "Real Convenience Food" series check out: Asparagus and Pea Soup; Tomato, Cucumber & Onion Salad with Feta Cheese; and Caramelized Onion and Mushroom Soup with Asiago Cheese. And don't forget one of our most popular posts ever: our Foolproof Caramelized Onions, made in a Crockpot! So glad you gals are enjoyed it! We went apple picking recently, and made this recipe, it was so easy and it came out delicious! Almost like an apple "butter" since it was thicker than regular apple sauce. We like it for breakfast, spread like jam on buttered, toasted gluten-free bread. So glad you liked it! It's good to hear the regular blender worked well; I never tried it that way. Just made the applesauce and it's so good! and it was really easy! I have never made applesauce before and was surprised it didn't call for sugar or something, but after tasting, it's not needed. Also I used a regular blender instead of an immersion one and it worked great. Delish! and you're right about the wonderful smell in the house too! Thank you for trying it (and reporting back)! Very tasty! Thanks for the idea, definitely a great way to use up some of those apples! I have a small crockpot, so I think I'll make another batch to put in the freezer. Definitely delicious right out of the crockpot when it's nice and warm, thank you FBS! 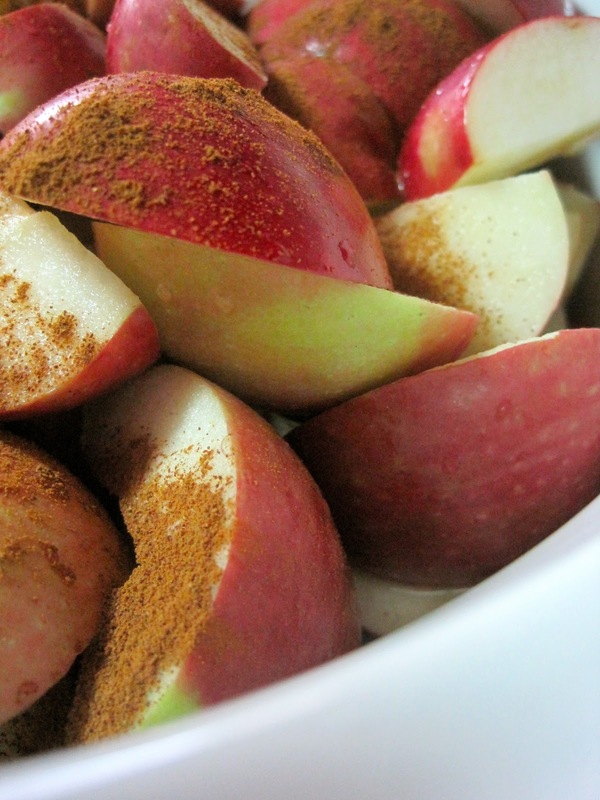 I especially love it warm, right from the crockpot - tastes like warm apple pie! Love this, I do it stove top but to walk away would be great. Love in greek yogurt, love as is for dessert. 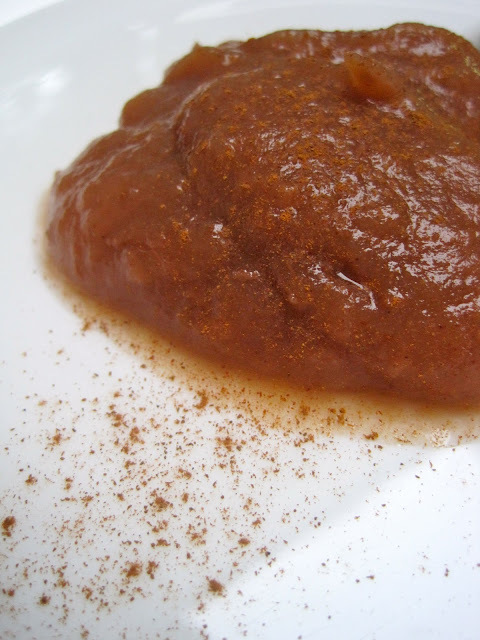 This is truly the simplest, yet most delicious applesauce I've ever made. I loved the color and consistency. I plan on freezing a bunch of it and using it as a dip, a snack and an oil substitute in baking. Very versatile! if you wanna pick it up, i've got a jar ready and waiting for ya! wow that looks great. I'll have to get a slow cooker. This is my favorite tip. "share a jar with friends who didn't get to go apple picking!" I hope it's your too Justine! Yum yum!!! I just need this rain to stop so I can go picking but maybe we'll just put on our boots and do some muddy picking... The season will end before we know it!! Once again another genius idea for the crockpit, Justine! We have an apple tree up at our cabin and we have a bumper crop of apples this year, so I know what I'm going have to make now!! Thanks for another great recipe!! Thanks so much, Lisa, let me know how you like it when you try it! PS. So jealous you have your own apple tree! love this recipe because it doesn't have you adding in all this sugar. Question: do the peels cook down to nothing?? question: i do like the idea of freezing it in small bags..... but has anyone put this in canning jars?? Fabulous, so glad you liked it! I love this idea! I always used my Dutch oven but the idea of just letting it do its work (the Crockpot) is wonderful! Love that you offered suggestions on what to do with it!! Just made a batch of this with our first bag of cortlands we picked. Wow. it is OUTSTANDING!! So easy, and so delicious. like candy it tastes so good. thank you!! 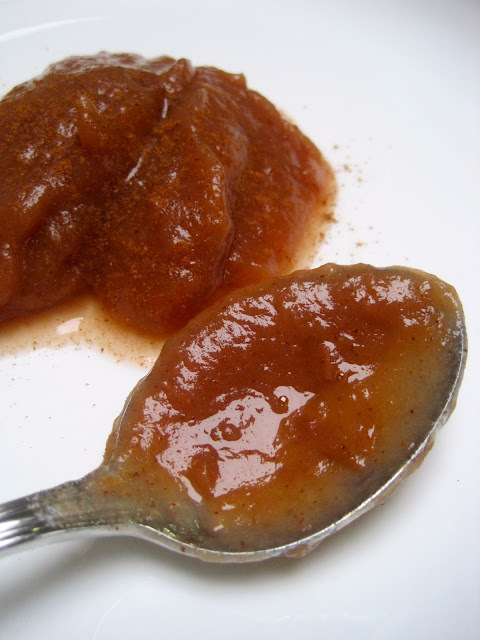 I've made my applesauce and apple butter this way for years. Thanks for sharing it. I wait until it cools and put it in my Vitamix, but we like a smooth applesauce. I also add a little clove and nutmeg. Absolutely, the food mill would work great! This recipe was "deee leee cious" says my 2 year old, Wendell. After a fun afternoon of apple picking we made this twice. He loved being a part of this meal from start to finish- picking the apples, "cutting" them, putting the apples in the crock pot, squeezing the juice and adding the cinnamon. We let it cook overnight and ate it warm in the morning with greek yogurt and granola. He even helped spoon it into jars to gift his little friends and their mamas that have new babies. It was enjoyed by many and Wendell loves telling people the story of how he made apple sauce. I will try to share some photos soon. Thanks so much! WAY better than any applesauce I have ever had! My 16 month old was two hands deep trying to eat it all up. Had to set some aside to put on my ice cream for dessert! Trying out my second batch tomorrow. Can't wait! Thank you, what an awesome review! This sounds great! Im going to the it now. You should try my recipe for Crockpot Apple Pie Cake! Yummm! We make it every year now and it's always perfect! I love that you used the crock pot for this! And, I love homemade applesauce with yogurt for breakfast. Thanks for reminding me. Must make this soon! We adore applesauce from a crock pot, this rendition looks mouthwatering! Nourish Your Children: Let Them Play Outdoors!